Sergei completed his studies at the Moscow State Conservatory and Russian Academy of Music. 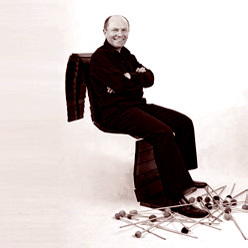 Acclaimed virtuoso marimba and xylophone soloist, Sergei has toured internationally and been awarded prizes and honorary diplomas at domestic and international festivals such as the National Percussion Contest, the International Festival in Korea and the Vienna-Music and Radio-France festivals in Europe. Sergei’s colourful interpretations of famous compositions, combined with master marimba technique have attracted tremendous public appeal. He has worked with the Melbourne Symphony Orchestra, played as a guest soloist on ABC Radio and television and for Channel Ten.